After classes we have a craft club for all children who can try their hand at a new technique every time. What we create and construct relates to upcoming holidays, the changing seasons and the weather. So around Christmas we make Christmas tree decorations and advent wreaths, at Easter we paint eggs and, to celebrate springtime, we decorate and erect a maypole. Autumn treasures such as fallen leaves, conkers or feathers are turned into wonderful creations but man-made objects like plastic bottles, lids or cardboard are also used. This way children learn that even simple natural things or items destined for the rubbish bin can become useful and valuable. We believe in Picasso’s famous saying, “Every child is an artist”, and help children discover their inner artist while engaging in positive, creative activities. Children become more confident; they develop their hand-eye coordination, imagination, creativity, concentration and patience but most importantly they have tremendous fun! When it comes to music, Hungarians have a secret weapon: the Kodaly Method, developed by Zoltan Kodaly (1882-1967), composer, musician, folk music enthusiast and teacher, and known throughout the whole world. Our music group follows this method to playfully develop the musical abilities of children. 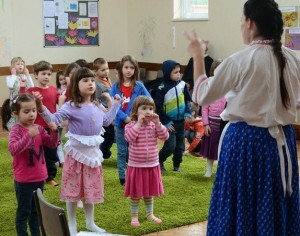 They learn to sing traditional folk songs and play the tunes on the violin and recorder. Notation, solfege and hand signing are also introduced and reinforced through games, movements and rhythmic exercises. The children also create their own simple musical instruments and use them while singing, to learn more about their wonderful Hungarian musical heritage. Dance loving adults, children and even babies on their parents’ arms all dance together in this lively and fun class, sometimes without even noticing how much they learn about their folkdances, folk songs, instrumental music, national costumes, customs and traditions. Above all the fun, this class focuses on the needs of the youngest children, getting them to experience the joy of singing and dancing together, playing rhythm games, clapping games and traditional circle games. Also giving the little ones the opportunity to try and take their first dance-steps by copying their older siblings, parents or teacher. Singing together or singing along with live folk instruments like the zither, the violin or folk recorders is a unique opportunity to help us form a community. 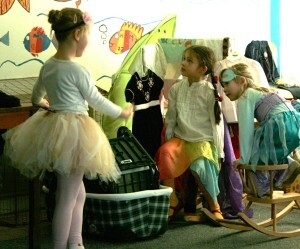 This club helps children express themselves through singing, dancing, dressing up and laughing a lot. 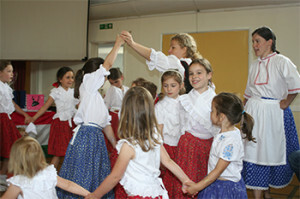 They work with famous musicals from singing the catchy tunes to memorising the lines in Hungarian to performing parts of them at our parties. Last year the club had a fantastic time putting together a short adaptation of the Jungle Book, and this year they are all getting transformed into singing-dancing practically perfect Mary Poppinses and cheeky chimney sweeps who all know how useful a spoonful of sugar can be. Families needing professional help with their children’s language development are warmly welcomed at this class. Early speech developmental problems, delayed speech, mispronounciation, auditory processing disorders, blocked communication issues, problems with flow, lisping and stuttering are all investigated. The sessions start with a detailed deep analysis of the specific situation and the findings form the basis of the therapy. 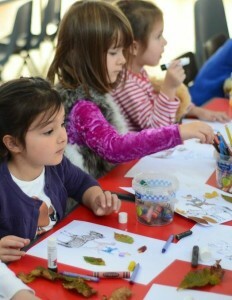 Developing the child’s memory, concentration and vocabulary is also an integral part of the class.